With the game tied at 6 and the bases loaded in the bottom of the 8th, Mustangs Outfielder Zach Smith sent the second pitch he saw screaming up the middle. Smith's hit would be enough to score two and put the game out of reach for the A's. With the win the Mustangs move within one game of second place and securing home field advantage for the MINK North Wild Card Game. The Mustangs started off hot scoring five runs in the first two innings, going into the 3rd ahead 5 to 1. Clarinda would answer immediately scoring three in the 3rd behind two home runs, courtesy of Reid Bonner and Cole Frederick. The next four innings would fly by with both teams netting a run a piece to tie it at 6 going into the 8th. 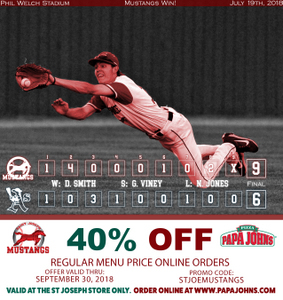 Following tonights win the Mustangs return home tomorrow night to play host to the Chillicothe Mudcats (13-24 MINK) on Mustangs Jersey Backpack Giveaway Night, courtesy of T-Mobile. It's also Splash Day and Friday Night Lites: $1 Miller Lite, Coors Light, Bud Light and Busch Light; $2 Drafts.